Hull type: Arc bottom hard chine hull in mid-to-aft areas with rounded side/bottom vee'd sections forward. Developed for FAST-G Stitch and glue sheet plywood construction. Power: Long shaft outboard motor to 40 hp. 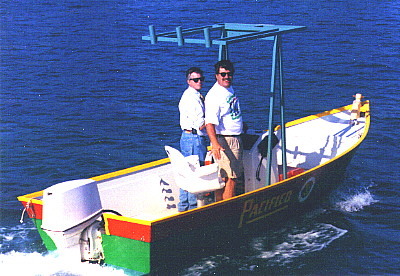 The CONSOLE SKIFF offers a large open cockpit with center console that's easy to build with the Fast-G Stitch and Glue construction method. Virtually every contoured part is furnished as a pattern. No need to use a bunch of dimensions to obtain planking and other parts. They're all furnished as Full Size Patterns. Special layouts illustrate how the parts are obtained from standard 4' x 8' plywood panels with virtually no waste. We've done everything possible to make this design simple and inexpensive to construct. But performance hasn't been short changed. The side/bottom forms a smooth entry with generous vee to provide a smooth ride. The skiff type hull is recognized as an excellent general use type. If a boat for fishing, skiing, just lazin' around, or having fun on the water is what you need, look no further. The CONSOLE SKIFF is for you!